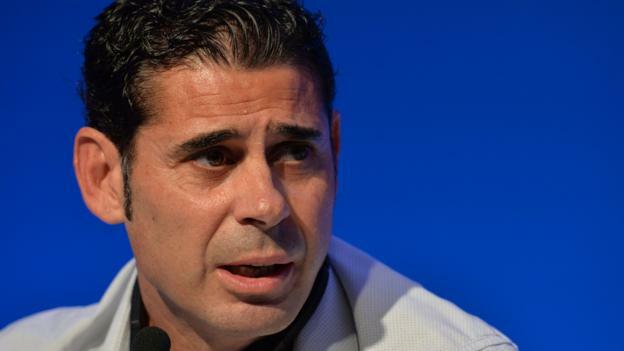 Spain have “no time to dwell” on the sacking of coach Julen Lopetegui, said temporary replacement Fernando Hierro. Lopetegui, 51, was dismissed two days before their first World Cup game after Spanish football chiefs said it was not involved in his negotiations to become Real Madrid boss. “We’ve come to fight for the World Cup,” said the 50-year-old ex-Spain and Real Madrid defender. Spain begin their World Cup campaign against Portugal on Friday in a match live on BBC One (19:00 BST kick-off). Hierro, who ended his playing career at Bolton in 2004-05, added: “The players are excited, they want this challenge. It’s a challenge for everyone. We have no time to dwell. Spanish football federation (RFEF) president Luis Rubiales, who revealed he was told of Lopetegui’s new role with Real five minutes before it was announced, said that Hierro was the first choice as a replacement. He left a Fifa Congress meeting in Moscow early in order to return to Spain’s base in Krasnodar. It has been claimed senior players – including captain Sergio Ramos – fought for Lopetegui to remain in charge for the duration of the World Cup. I admire their decision. It’s bold, it’s ruthless. I’m pretty sure they must have spoken to a number of players in the squad. I’m very surprised at the timing of it – two days before their opening game – but they still have an excellent, experienced squad with some top players in it. Will it affect them? We’ll have to see. As a player, I wouldn’t have liked it – you’ve worked for so long with a system, with a manager and you’re all prepared, and all of a sudden he’s gone. There’s huge attention on them now, huge questions. Without doubt, there’s more pressure on the players now.